Welcome to all things Dude! 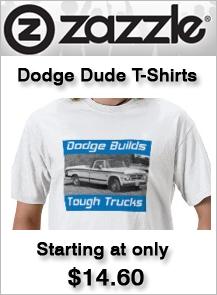 Watch for fall discounts off our T-shirts! They make a great gift. We also have new video up on YouTube of the cab getting more of the sub-lime lime. There are some mighty rare parts for sale in our Parts Section. Just have a look at those NOS Tail-Light Lenses! Back before the Dodge Little Red Express, the Chevy SS 454, the GMC Cyclone, or the Ford Lightning there was another muscle truck. The truck you see pictured above is the Dodge "Dude" Custom Sweptline special. The Dodge Dude pickup truck came with factory options such as the powerful Mopar 383 V8, Bucket Seats, a long sweeping body line that ran all the way from the hood to the tailgate. And of course, the signature giant "C" stripe that followed the body line all the way down the side, (simular to the legendary Dodge Superbee), except instead of that classic bumble bee you had - "The Dude." 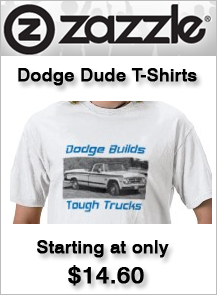 Dude trucks were manufactured in 1970 and 1971 model years. It is widely estimated that somewhere between 1500 - 2000 of these trucks were ever made. So, if this is the first time you are ever hearing about the Dude pickup truck built by Dodge and you're a true blue Mopar fanatic, don't feel bad. 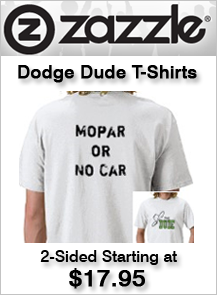 Chances are most Mopar fans haven't heard of the Dude either! In fact most Mopar fans probably couldn't even tell anyone what a 1970 or 71 Dodge truck looks like. These trucks are dead rare to begin with. And, finding a Dude anywhere would be like finding a needle in a haystack.